The principal outcomes from the consultation phase of this project were to create a new identity that portrayed a sense of heritage and underpinned the school’s commitment to traditional values of learning and not to dilute, but rather enhance the reputation of this ‘Ofsted Outstanding’ school. At the same time, the logo, as the keystone of the identity, needed to reflect the progressive nature of the school’s ambitions and the importance placed upon the adoption of new technologies, ideas and learning environments, such as the new Learning Hub and the installation of integrated digital resources. The principal outcomes from the consultation phase of this project were to create a new identity that portrayed a sense of heritage and underpinned the school’s commitment to traditional values of learning and not to dilute, but rather enhance the reputation of this ‘Ofsted Outstanding’ school. At the same time, the logo, as the keystone of the identity needed to reflect the progressive nature of the school’s ambitions and the importance placed upon the adoption of new technologies, ideas and learning environments, such as the new Learning Hub and the installation of integrated digital reources. 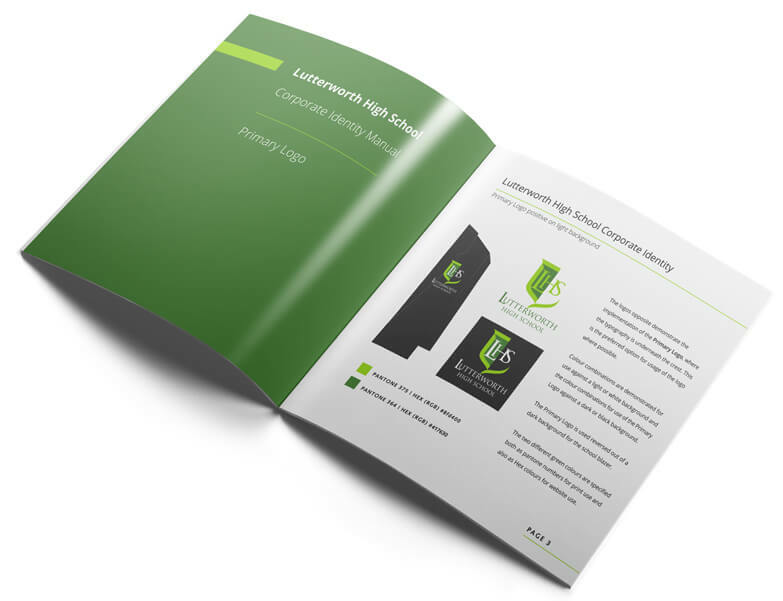 Since the status of the school was changing, this was a fairly open brief and a chance for a fresh start, requiring no particular loyalty to the school’s previous visual identity. 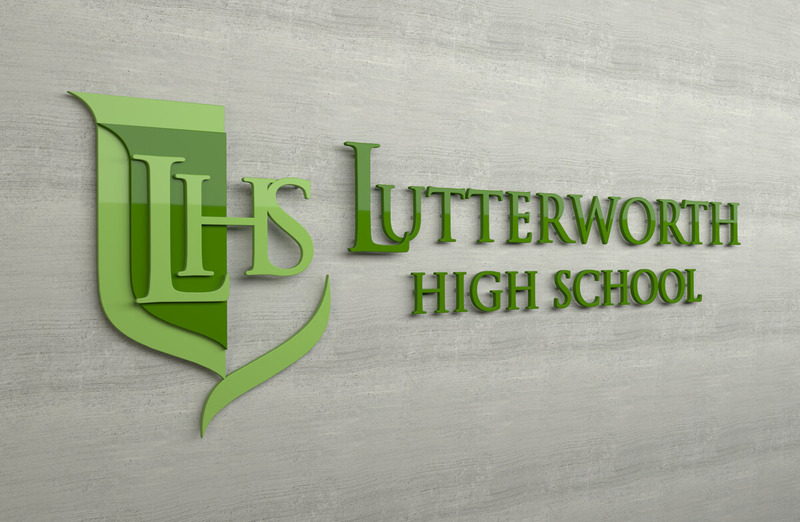 The final design solution of the logo incorporated a crest to refer to traditional values, but designed with a uniquely fresh and contemporary look to reflect progressive attitudes within the school. Dynamic elements are used to suggest the sense of ‘social mobilty’ through quality education. The ‘often seen’ symbols within school crests were dispensed with to project a clear, strong and decisive mark. Colour combinations within the identity reflected those used within the school building and significantly those of newly refurbished areas. The use of the abbreviation of ‘LHS’ was finally decided upon as this was the term affectionately referred to for the school by students. 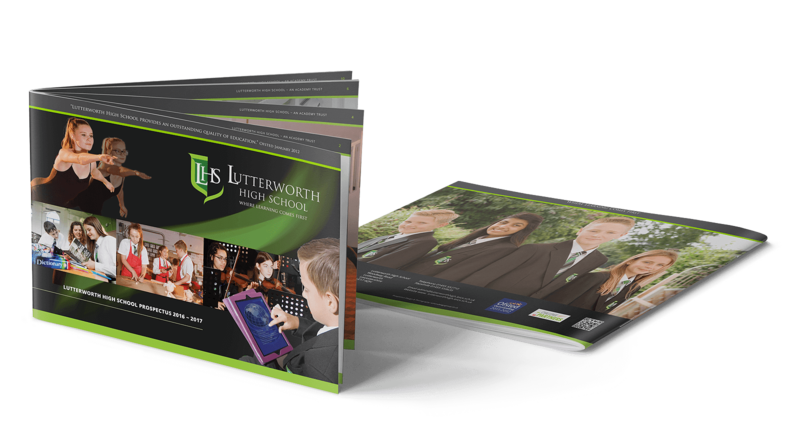 New school branding cohesively applied to all Lutterworth School digital and printed publications, with consistent implementation of corporate styling, graphical elements and colour schemes. 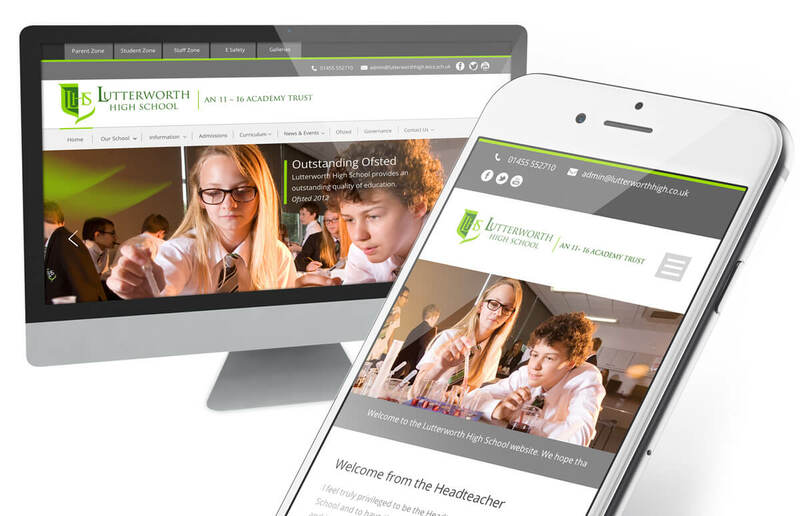 The new school branding was cohesively applied to all Lutterworth School digital and printed publications, such as the prospectus and website, with consistent implementation of graphical elements, colour schemes and photographic styles. Carefully crafted, panoramic style of photography, avoiding distortion, used for inside spreads of the prospectus to clearly show the school facilities,. Multi-functional, fully responsive, bespoke website design and development, for automatic reformatting and viewing on desktops, laptops and all hand held devices. Incorporates ‘google analytics’ and integrated marketing tools. … so much more than a website, but a powerful marketing strategy tool. Pupils actively participated in the conceptual element of the logo with Wilson Design Group and Lutterworth staff and played a key ‘decision making’ role of how the uniform should look. 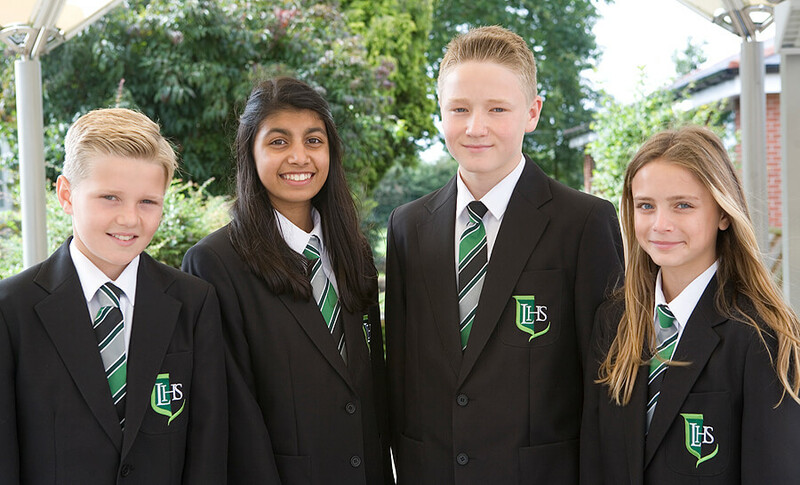 Students and staff consulted with a well know Leicestershire Clothing manufacturer and distributor in the design of the school tie.